Revision 55272 is now live on Steam! You will automatically receive this update when you start Nom Nom Galaxy. You can check your current revision on the titles screen next to the copyright information. In this update we’ve improved controller and keyboard + mouse support, added a preliminary save system, and added pause functionality. Thanks for all of the feedback we’ve received via the Steam Community forums. It’s been extremely helpful! We’ll continue to work on bugs and requests for the next update. Please head over to the Nom Nom Galaxy Steam Community forums to contribute! Select “Continue Work” from the main menu to load most recent save data. Data is saved per stage, but only one file is created per stage at the moment. Games are saved at the end of each day. Save states don’t distinguish between 1P or 2P, so you can continue a game with a new player or without one. The game pauses when opening up the control guide and quit game dialog. Added controller assignment options to the options menu. If a controller is not connected, controls will default to keyboard + mouse. At the end of the day, Astroworkers will gain full HP and oxygen. Recipe Maker renamed to Soup Factory. Fixed bug causing buildings next to Soup Factories to fall after it was unlocked. Shotgun can now be fired with L2 or R2 when using a controller. Fixed bug in 2P mode that prevented exit dialog from properly displaying when pressing Esc key. Adjusted unlock costs of items in the research menu. Lowered the cost of Soup Factory to 300 Matter. One of our goals with Nom Nom Galaxy is to have a diverse variety of plants and animal for you to fight, cultivate, harvest, and ultimately make into soup. One such creature is our space mammoth. It’s been chillin’ on the planets of NNG for a while now, but has been pretty harmless thus far. That all changes next week, with Yamatron working on new attacks and AI for the now stationary beast. We’ve received a lot of great ideas from fans on Facebook and Twitter, so we’re sure we can make it a memorable member of the NNG family. One of our interns testing NNG had a bit of fun with the mammoth yesterday afternoon. In an ultimately vain attempt to snuff out it’s digital life, he created a massive array of Missile Towers. Here’s a video of the failed attempt – Missile Attack! I talked to Sawa and it turns out the mammoth isn’t really immortal; it’s got 2.1 BILLION hit points! So technically you could kill it. But by our estimates that would take a couple of weeks! Keyboard and mouse support went in over the weekend (yeaaa!) but we’re just getting all the in-game prompts settled this week. Right now you can see what keys are assigned to which action by pressing F1 while playing. It’ll bring up this handy menu! 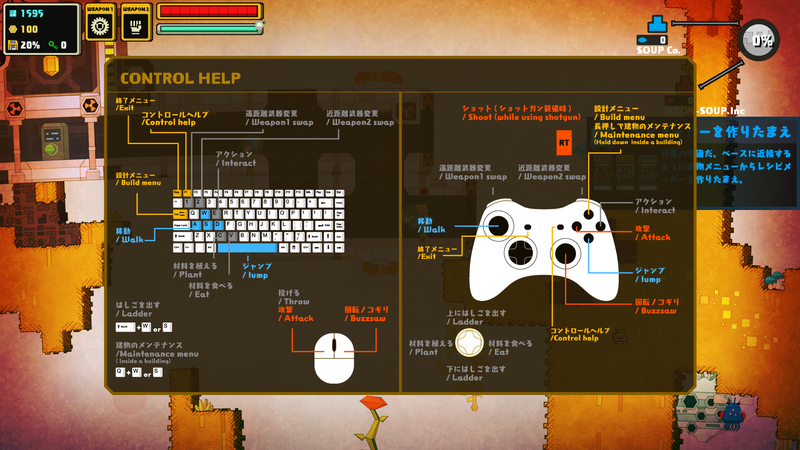 Part of our never ending mission this week is to make controls more intuitive for kb+m players. Yamatron put together a mock up of some of the icons that could appear. This is just a test for us to check the size and visibility of each icon. You won’t see all the icons crowding the left side of the screen at the same time when this goes into the game. Are you playing with a mouse and keyboard? Let us know what you think about the current setup in the Nom Nom Galaxy Steam Community! Revision r55218 is now live! The first of many updates! This update should download automatically when you start Nom Nom Galaxy. You can check your current revision on the titles screen next to the copyright information. There is currently an issue that disables the keyboard when a controller is plugged in during single player mode. This is being addressed. – Added In-game keyboard and mouse control guided added. Press F1 to access. Above: Tomi & Sawa discuss different control layouts for KB+M. This is what is being worked on today! Add mouse collision detection to places like the main menu, dialogue boxes, pause menu, etc. Updating the key-mapping for KB+M to reflect current gameplay. Most of the current key-mapping is old, hence the lack of some abilities via KB+M. Above: Yamatron schools me on different assets we need to create. Below: Adding mouse collision for the main menu. We’ll be pushing through this today. Hopefully we’ll have an update ready tonight. In the mean time, #SWAGnacious has assembled a guide of sorts for the current KB+M controls. Welcome to the Nom Nom Galaxy! Thanks for being part of our grand experiment with Early Access! This is the first time a PixelJunk game has ever been in the public in such a raw state, so of course we’re very nervous! This is the first of many updates we’ll use to keep you abreast of what’s going on with development. 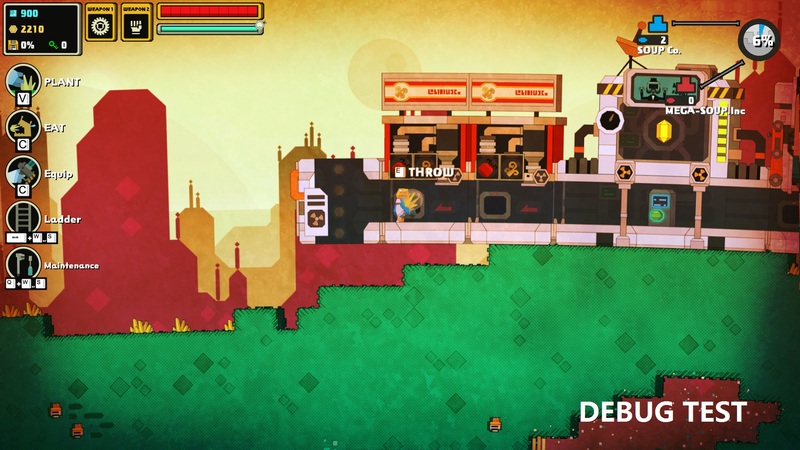 You can find these updates on Steam and also on our dev blog (http://nomnomgalaxy.com/). 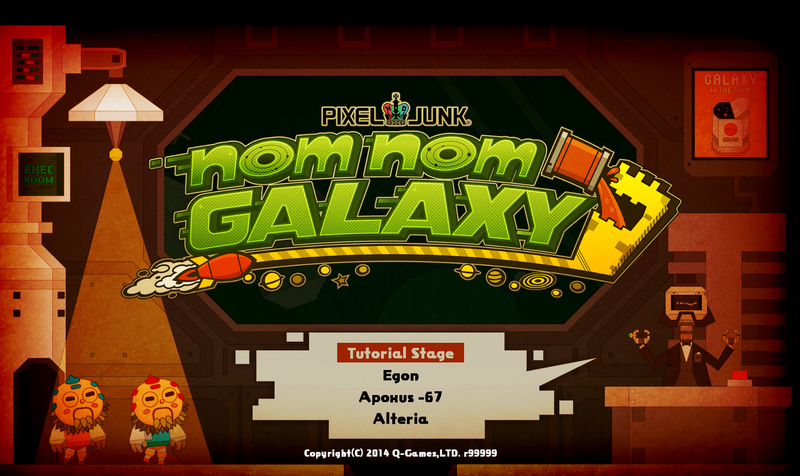 But before we get too deep into the soup, let me give you a little background on PixelJunk games and Nom Nom Galaxy. Q-Games is a modest sized studio (we’ve got about 40 people here now) but the core PixelJunk team is usually just a fraction of that. PixelJunk games usually start from tech concepts from a very small team and then blossom into full-fledged games as we find gameplay to match those concepts. With Nom Nom Galaxy, we followed the normal formula, starting with a small team working off of a concept of deformable environments combined with some base building and tower defense elements. From that base we’ve been changing and tuning the game ever since. The art style has changed a few times, along with some of the core gameplay systems, all in the name of perfecting our soup, if you would. And that leads us up to the present – Nom Nom Galaxy on Steam Early Access. You may be wondering, “Why have you chosen to open up development?” Well, releasing on Steam gives us a lot of options we didn’t have when making games for the PlayStation Network in the past. Through Early Access, we’ll have the chance to get constant feedback about Nom Nom Galaxy that we can work into the game. We also get your help finding crazy bugs and testing the game on way more systems than we could hope to here in our small office. So now that you know a little history behind Nom Nom, let me introduce you to our five man team! The core Nom Nom Galaxy dev team is made up of two members: designer and programmer Tatsurou Sawa, and the robots and beer loving artist, Yamatron. Overseeing the project is our veteran PixelJunk producer Tomi, and PixelJunk Final Boss, Dylan Cuthbert. And finally, I’ll be the liaison between you all, the community, and the rest of the team! Bugs! – We know we’re going to have a fresh batch of bugs come into the mix as everyone gets their hands on Nom Nom. We’ll be squashing game breaking bugs with impunity. Saves – There isn’t a functional save system in place just yet. We’re working on that. Pause – There isn’t a pause for Nom Nom now thanks to design issues with networking and multiplayer. AI Tuning – We’ll be using your feedback to find the gameplay balance sweet spots. We’ll be using our Steam Community as our main means of communication for Nom Nom. All of your praises, rants, requests, and bugs should go there. 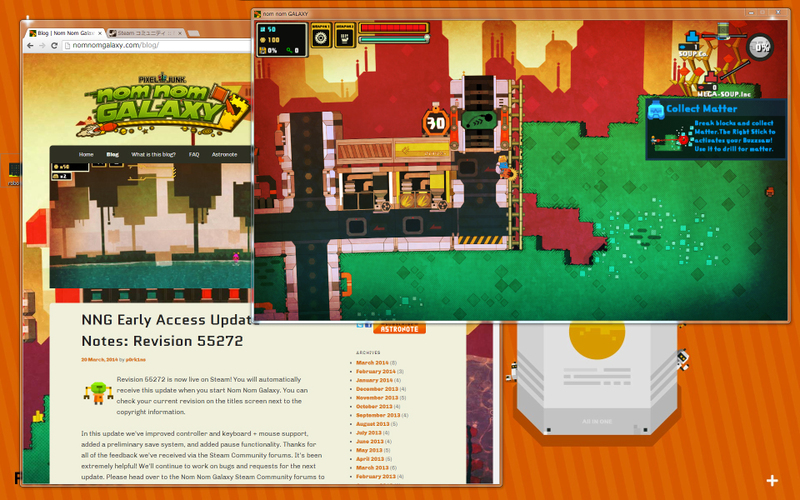 You can also email us directly at nomnomgalaxy@q-games.com. We’ll be collecting everything you post or email us, and I’ll do my best to address your questions, concerns, love-letters, etc. So there you have it! Alpha Update #1 complete! I’ll be back soon with another update, so enjoy the soup while you wait! Nom Nom Galaxy Early Access Starts March 13th! We had an amazing first day at BitSummit 2014. The place was packed with devs eager to show off the results of their blood, sweat, and code to a hall packed with gamers. Q-Games announced the new name for our latest project, Nom Nom Galaxy, and also revealed that we’ll be going live on Steam Early Access next week! For more information about Early Access and our KickStarter-styled tiers for supporters, please check out the page! BitSummit MMXIV – Volunteers Needed! Interested in taking part in Japan’s biggest indie gaming event? If you speak Japanese and have a love for indie games, we could use your help! Q-Games started BitSummit last year to help open a dialogue between the Japanese creators and western media. It was a resounding success and as a result, we’ve grown even bigger this year. The show now spans three days and has over 120 developers, several platform holders, great musical guests, and even some surprises. 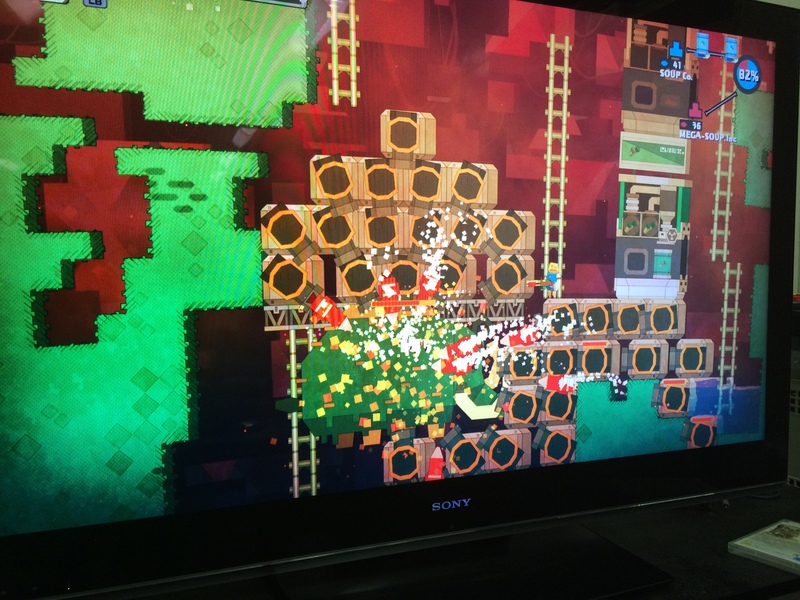 As amazing as last year’s show was, we think we’re going to really shake up the indie dev scene with BitSummit 2014. But there are a few pains associated with our growth. Because of show’s size, we’re looking for people to help interpret for media and devs. We aren’t looking for people who can translate Japanese and English perfectly; our goal is to find gamers who are comfortable speaking Japanese and have a love for indie games. You bring us your talent and we’ll put it to good use. If you can to help us, we’ll give you a pass to the show for the all three days, an exclusive BitSummit staff t-shirt, and lunch! You’ll be able to attend the cocktail party on Friday night and rub shoulders with all of our presenters, and listen to Chipzel and Baiyon lay down some phat beats! Of course, you main mission will be to help everyone communicate. We’ll let the devs know that you’re a interpreter for the show, and perhaps even assign you to help some of the media depending on your skill level in Japanese. If you’re interested in taking part, please contact us at contact@bitsummit.org ASAP. If you aren’t interested but you know someone who might be, please let them know that we are actively looking for more people. The more help we can get the better! We’d love for you to be present every day, as it insures that both the media and devs are familiar with you and your role at the show. If you can’t that’s okay, too. If you’d like more information, please email contact@bitsummit.org with the following information.